The past thirty-five weeks have not been easy. The actual progression of pregnancy, and the preparations needed for the child once she is born, should be viewed (in my opinion, at least) as two distinct acts that happen to be occurring at the same time. First, there are the physical and emotional demands of the pregnancy itself: the bodily changes, the exhaustion, and the things they don’t necessarily warn you about (such as the trialed attempts at becoming pregnant, prenatal depression and pregnancy gingivitis). Then, there’s the endless list of preparations: creating a nursery, baby-proofing the home, finding places for all of the new baby-things, and the absolute emotional severity of nesting. This is hardly an exhaustive list of these two “acts,” but I hope it can be assumed that a journey such as this one is difficult and requires support from many, many people, even when that means turning to writers for solace and advice—and I don’t just mean the editor of What to Expect When You’re Expecting. 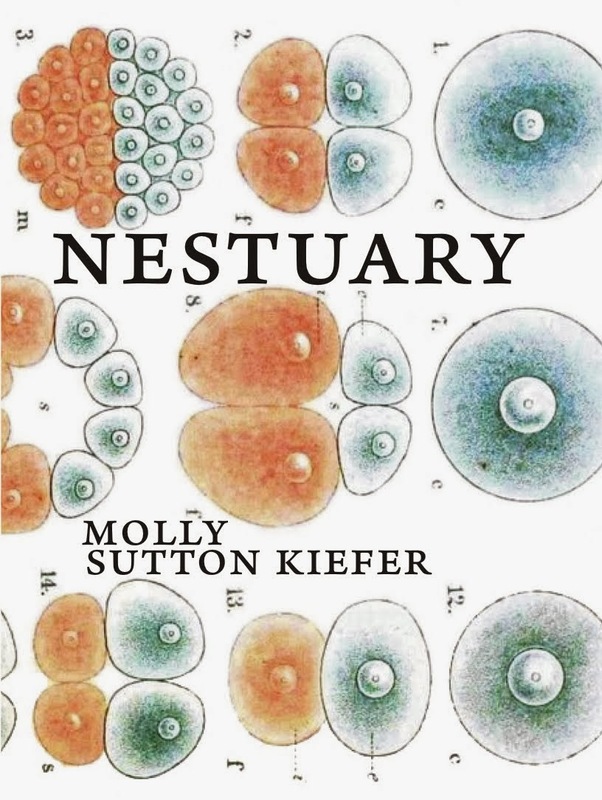 When I first came across Molly Sutton Kiefer’s Nestuary, and read from Arielle Greenberg’s review— “Nestuary is a compelling document of the alchemical nature of pregnancy, childbirth, breastfeeding and becoming a mother. . .These ‘little needle songs’ of violence, love, illness and power are. . .sung urgently and out of order, as they should be”—I knew this was a must-read. This concept of pregnancy being perpetually “[urgent] and out of order”, as well as involving “violence, love, illness, and power”, screamed of truth to me, and I was confident that, in reading Kiefer’s lyric essay, I might find community. After reading Nestuary, I can tell you, this expectation was beyond-true. Molly Sutton Kiefer’s lyric essay, Nestuary, is divided into three distinct sections: the first, attempting to become pregnant; the second, discovering one is pregnant and going through the pregnancy and birth; and the third, reflecting on the birth, the early years of child-rearing and becoming pregnant again. There are certainly overlaps between these sections, as well as acts of hindsight, as Greenberg suggested, though this is the relative arch of the piece, taking us through the attempt, the pregnancy, and the motherhood. I found myself becoming more and more emotionally-twined into this piece, as so many of the occurrences related to my own: the difficulties involved in becoming pregnant in the first place, and then many of the hardships that can occur (physically and emotionally) throughout the arch of the pregnancy, as well as even (out of anticipation) how some of her mothering experiences either calm or fuel my own anxieties and excitement at finally holding and raising my child. However, even for women who have a very different pregnancy from Kiefer, or view breastfeeding and motherhood differently, there is still plenty of room for relating to her experiences and opinions, as the larger themes of the essay relate to the beauty and hardships involved in any pregnancy, the launching into the unknown of the childbirth and beginnings of motherhood. These are concepts that, no matter how difficult or easy-going the pregnancy or the act of becoming pregnant may be, every mother will face: questions and expectations of her role as mother, questions about the baby; the list goes on. This significant shift in societal and domestic role as mother is, without a doubt, glaring in Kiefer’s essay, as we all have to make a quick and full transition during the course of our pregnancy and, suddenly, at the arrival of our children. In a matter of ninety-seven pages, Kiefer takes us through her harrowing journey of pregnancy attempts and going through pregnancy, as well as the after-life of raising a child and bearing another. Its language waxes poetic for much of the piece (which I love and feel should be freely pursued in the context of this form); but it also functions beautifully as a lyric essay, as it contains, both, a personal narrative and research of some of the older myths surrounding pregnancy and birth. Revealing and lovely, hopeful and brutally-honest, Nestuary becomes a story and an informant for any to-be mother as it unravels socially-accepted beliefs (new and old) and presents a very-personal, very-individualistic story of one woman’s journey through pregnancy and the early years of child-rearing. The further I waded into the complexities of this tale, of the myths, of the specifics, the more I knew that I needed to keep reading, that I had found a common-ground with another writer, and that, all-in-all, these fears and perceived short-comings throughout my own pregnancy were okay. They were normal, and could be learned from, and will be grown from. Reading a parenting guide or a series of articles online about the importance of raising a child this way, or the educational implications of that, will not tell you so much about the hard stuff, or the truth behind all of the “beauty” of pregnancy and motherhood, or the emotional hardships of all of these changes. As a new mother, you’re expected to simply know these things, to move forward gracefully; and there are unwritten social implications for those women who struggle to do so. An essay like Nestuary teaches you, informs you, and comforts you that this simply isn’t the case, that this isn’t easy, and that you won’t be perfect—and that’s okay. After thirty-five weeks, I needed to hear that. Before my daughter is born, I need to hear that. And while I am raising her, and learning the ropes, I’ll need to remember that. Molly Sutton Kiefer created a safe environment for a new, excited, and worried mother like me, laying all the truths out for me to see, rather than covering them up in baby powder and make-up and beautiful after-birth photographs hung throughout a house. She offered that community I needed, and I expect, between this essay and her continued endeavors, that she’ll be providing this same service to many women, and that I’ll continue to recommend her work. From one writer to another. MOLLY SUTTON KIEFER is the author of the poetry chapbooks, City of Bears (dancing girl press, 2013) and The Recent History of Middle Sand Lake (Astounding Beauty Ruffian Press, 2010). She is poetry editor for Midway Journal and runs Balancing the Tide: Motherhood and the Arts | An Interview Project. She lives in Minnesota with her family. You can see more about Nestuary here.